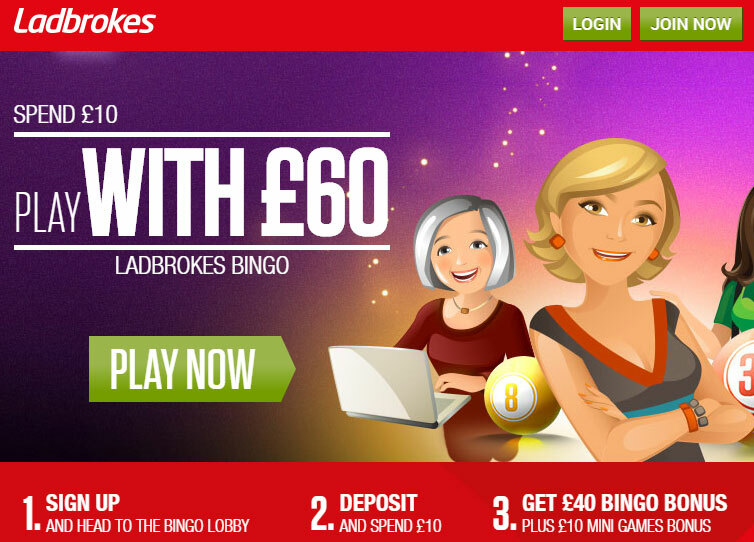 Join Ladbrokes Bingo and spend £10, play with £60! If you’re looking for a great time and loads of laughs then get involved and becomepart of a huge community with so much to offer. And this is just the beginning. Sign-up now and enjoy all the benefits you’d expect from the most established name in betting and gaming with Laddies Bingo offering the best loyalty scheme in the business. Check out the huge range of bingo games, fantastic slots, scratchcards and more across a site that’s bright, breezy and got everything bingo fans could ever need. Powered by Virtue Fusion software, Ladbrokes Bingo provides a smooth and visually appealing experience across desktop, mobile and on tablet. It’s so easy to find your favourite games thanks to the handy menus and search bar with ‘Top Games’, ‘New Slots’, ‘Jackpots’, ‘Scratchcards’ and ‘Numbers’ all listed meaning the choice on offer doesn’t have to seem overwhelming. As you’d expect 90-ball, 80-balland 75-ball games feature prominently with Ladbrokes Bingo’s packed schedule offering tons of chances to win great prizes day and night. There are also a number of rooms offering big money linked games and Special Rooms such as Deal or No Deal and Who Wants to Be A Millionaire? Essentially though, Ladbrokes Bingo is designed to be like a house with rooms named ‘The Living Room’, ‘The Garden’ and so on. Other than bingo games there are loads of slots to enjoy so it’s pretty much impossible not to be entertained. Top slots Rainbow Riches, Clover Rolloverand Dynamite Digger feature alongside mega Jackpot titles such as Bouncy Balls and Chests of Plenty. Looking for a quick bit of fun? Try out the incredible range of Scratchcards. Just scratch and see what you’ve won on Millionaire Scratch, Bingo Scratch and more. New players receive fantastic rewards right from the moment they sign-up. Spend £10, Play with £60! And the bonuses just keep on coming. Ladbrokes Bingo runs a bespoke On The House Rewards scheme that’s the most generous of its kind. Play your way through the house and earn Double Loyalty Points, Free Bingo and grab a Birthday Bonus! Ladbrokes Bingo knows how to take care of its roomies with a friendly Customer Support Team on hand 24/7 should you not be able to resolve your query through one of the bubbly and helpful Chat Moderators. Get in touch via telephone, email or Live Chat, safe in the knowledge that you’ll be dealt with the utmost care and attention. Call 0800 731 6191 or get in touch via one of the options mentioned above. Making deposits and withdrawals at Ladbrokes Bingo is easy, quick and most importantly, secure. Using SSL technology Ladbrokes keeps your precious information safe and hidden and there are numerous payment options available, including VISA, Mastercard, Paypal, Skrill and Neteller.